As I had mentioned a couple weeks ago, most of the OpenStreetmap data (as of Dec. 2010) in Cleveland was generated from TIGER data in 2007. Some of this data had roads that no longer exist, were not at the same GPS coordinates as in real life, and did not have roads that were newly created, or had incorrect names. 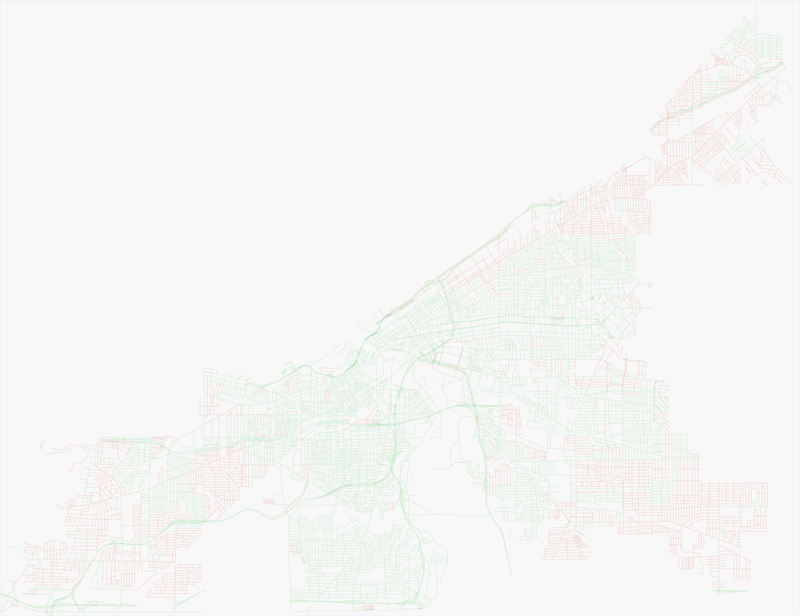 I’ve traveled on many of Cleveland’s roads to verify the existing data. As I began editing the Cleveland area in OSM, the TIGER map on Mapquest displayed with relatively high accuracy of what I’ve verified but also I or other OSM users have made edits to the map where the roads have not been verified (in the data, for example, I would split the road, as two pieces connected together, to verify one part but not the other). This edit would result in both roads marked as edited in TIGER map on Mapquest. I created my own map using osmarender to display what streets I and other OSM users have verified within the city of Cleveland. Each way contains multiple tags that describing the way. One of these tags ‘tiger:reviewed’ was automatically added to each way imported from TIGER. It’s a superfluous tag and I and some other OSM taggers around the US have removed the tag from the way to verify the rest of the tags in a way is correct and that the way is in a correct place. The style was based off a TIGER map on Mapquest which marks in green the roads that have been edited in any way since they were first imported from TIGER and red which have not. Click Here to view the map (PNG, 10 MB) of what’s been verified so far as of Nov. 1, 2011. The stylesheet for this map has its own github page. (Writing this page reminded me how poor OSM documentation is in some instances).